Today RIM announced that they will be acquiring Chalk Media Corp. I have been a believer in Chalk ever since I first saw them at WES in 2007. In fact Doug Soltys from BlackBerry Cool and I recorded a podcast at WES that year where we spoke to Brook Van Hatton from Chalk. If you'd like to take a listen, click here. The product that was creating a stir at WES was called Mobile Chalkboard. Continue reading after the jump for more info on Mobile Chalkboard and what I think the acquisition is all about. 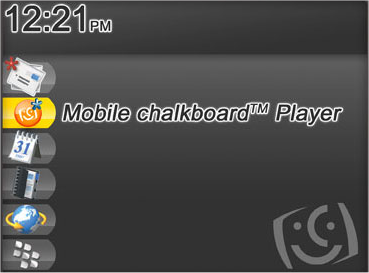 Mobile Chalkboard is a product from Chalk that allows an organization to create and securely deliver multimedia content to their population of BlackBerrys. The multimedia content can consists of static slides with or without voice-overs, video, audio, and animation (Plazmic). All of the content is automatically converted so that it is BlackBerry friendly, and mindful of bandwidth constraints. The content can also include tests or feedback sections so you can test a viewer's knowledge of the material or request feedback. The latest version of Mobile Chalkboard even includes the ability to subscribe to video or audio podcasts. There are three parts to Mobile Chalkboard. The first is the contentment creation. Chalk has a Microsoft PowerPoint plug-in that once installed, allows someone creating content for their BlackBerry users to create any PowerPoint presentation, embed any audio (including using a PC attached microphone right in PowerPoint) and video content, then use the new Chalk menu to publish to content to their users. When the Chalk publish option is selected within PowerPoint, the person creating the content can select who the content should be delivered to, or a group of users like all of Marketing, Entire company, etc. The author can even choose when the content should be delivered. Once the choices have been made, the Chalk PowerPoint plug-in converts the entire presentation, including any video and audio, and sends it to the Mobile Chalkboard server. The second part of Mobile Chalkboard is the Mobile Chalkboard server. The Mobile Chalkboard server can reside behind a company's firewall, or hosted at Chalk. Access to the Mobile Chalkboard server is all web based and can be set to use secure HTTP (HTTPS), especially useful for the hosted option. Access to the Mobile Chalkboard server is based on roles. Administrators can add Chalk users or add Chalk content authors, content authors are allowed to create content, etc. The Mobile Chalkboard server GUI also allows for content creation or modification if the author chooses not to use the PowerPoint plug-in. One key point about the Mobile Chalkboard server is that it keeps track of the type of BlackBerry each person has and delivers only the content that the particular model can handle. For example, BlackBerry 8700's running an OS below 4.5 cannot display video, however they can play audio. 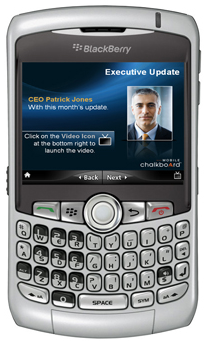 If video content it being published, the BlackBerry 8700's will be excluded. The third part of the Mobile Chalkboard is the BlackBerry client. The client, once installed, registers with the Mobile Chalkboard server and receives any content that is sent. The Mobile Chalkboard client works with the Mobile Chalkboard server to break up the content into smaller and smaller pieces in the event that any BlackBerry Enterprise Server (BES) or BlackBerry Internet Service (BIS) have data size restrictions. Once all of the pieces have been downloaded, the content is put together and displays in the Mobile Chalkboard client. At the same time, the client reports to the server that all content is received and an email is sent to the user. If that option is not chosen, then the client simply displays an asterisk on the icon to indicate new content. 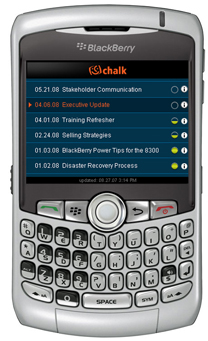 The Mobile Chalkboard client also manages the BlackBerry's memory usage to ensure that the Chalk content does not fill up the device's memory. The client will also favor external media for content storage. As a Mobile Chalkboard user views the content, the client keeps track of what slide they are on. This allows the client to report back to the server so that the content creators can gauge the response to the content. The content creators can set completion criteria, like gaining a certain percentage on a test, and a certificate can even be directly emailed to the user upon successful completion. One final note about the Mobile Chalkboard client is that any content delivered to the BlackBerry is stored in memory and can be viewed regardless of whether the device has a signal. The content is truly local on the BlackBerry. Mobile Chalkboard can be used for all kinds of things. For example, financial firms can use it for business continuity (disaster recovery) by pre-populating important documents that can be used during times when all connectivity is lost. This could be call trees, congregation points, etc. Financial firms could also use it for recordings of morning calls, management update videos, or even compliance training. Financial firms can also use it for their clients by providing rich content to them securely and wirelessly like wireless research with a click to call the analyst directly, and voice blasts or information. Professional Services companies can use Mobile Chalkboard for technician how-tos or tips and tricks, or even extend it to their clients to provide satisfaction surveys or information dissemination. IT departments can use Mobile Chalkboard for self-help presentations, announcements, and gathering feedback from their user community. Compliance departments can use Mobile Chalkboard for updates to compliance and ethics training (including testing knowledge). There are really so many uses for Mobile Chalkboard, and these are just some of them. What Does RIM Want with Chalk? This is pure speculation but I think we can assume that RIM would like to incorporate the Mobile Chalkboard technology with future BlackBerry device and server software. RIM has done this with other technologies like their attachment viewing feature addition, acquiring Plazmic and incorporating the Plazmic Media Engine in the BlackBerry OS, or more recently acquiring Ascendent Systems and incorporating the fixed mobile convergence technology into the BES and the BlackBerry OS. The attachment viewing and Plazmic technologies were integrated for free, but the Ascendent technology while integrated already, requires an extra purchase. That is what we do not know right now. Will Mobile Chalkboard be integrated into the BES and BlackBerry OS? If so, will it be provided free, or require an extra purchase. It would be wonderful if RIM provided the Mobile Chalkboard functionality free as part of the base product, but I'm going to guess that it will be an extra purchase. If the Mobile Chalkboard functionality will be an extra purchase, I do not think that is a bad thing at all. Mobile Chalkboard is an amazing product and allows organizations big and small to do amazing things. In conclusion I think that whatever happens during this acquisition, the outcome will be very beneficial to the BlackBerry community. If you would like to learn more about Mobile Chalkboard, click here.